Posted 10:02 pm by Administrator & filed under News. HPA is thrilled to participate in the Chicago Architecture Foundation’s “Between States” exhibition! As a partner program of the Chicago Architecture Biennial, CAF challenged 50 design teams to reimagine a physical asset in one of the city’s wards into a community-based project. Our design team’s concept transforms a water intake crib into an eco-island and landing point for scientific research, recreation, arts and music performances, and wildlife viewing. Located approximately 2.1 miles offshore from Chicago’s Montrose Harbor on the North side, the Wilson Avenue Crib was constructed in 1918 as part of a network of off-shore water intake cribs used to deliver clean water to city residents. The stone and brick structure has a 40-foot-diameter inner chamber, and is connected via a deep tunnel to a landside pumping station. The City has slated it for demolition. The elegant, free flowing structure plays off of the water surface but ties into the existing artifact. The permanent structure would be renovated as the central focal point creating an open observation deck and interior research support spaces. An amphitheater would be anchored to and wrap around one side of the existing structure. Four large compass-like spines that follow the cardinal orientation extend from this central node and are programmed with activities that encourage research, discovery, relaxation and recreation. 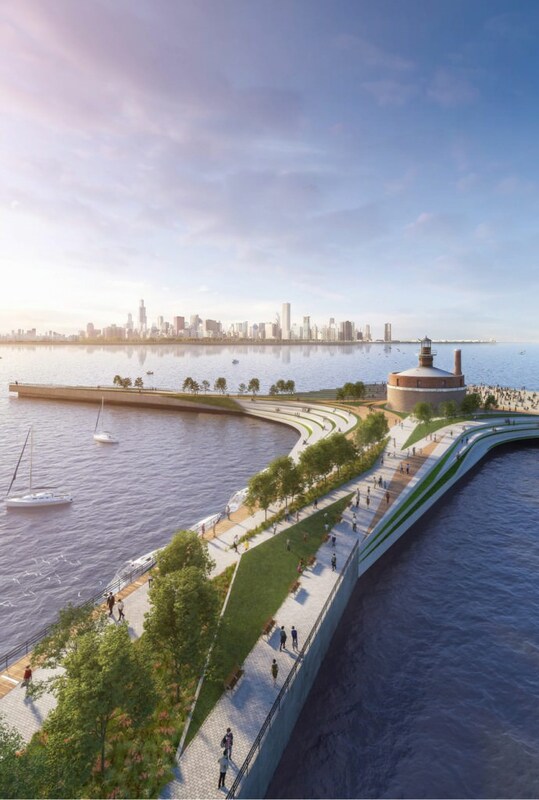 We strive to bring attention to one of Chicago’s greatest resources – Lake Michigan – by transforming a forgotten but once critical component of water infrastructure into a stimulus for education and research, as well as a recreation and entertainment destination. Thanks to @chiarchitecture and curator @TeamUrbanLab for the opportunity to participate in this ambitious vision to bring real, positive change to Chicago. Between States will run from September 20 through January 8. 2018, at the CAF Atrium Gallery at 224 S. Michigan Avenue in Chicago.